I am including some garden photos with this post. The last couple of weeks I have been contemplating how I would like to make some changes to my blog posts. We have started our 5th year living at the Geek's Quad and I want to start sharing more of what it means to live off-grid as well as to pursue a more self-reliant lifestyle. For the past 4+ years my blog posts have been informative, but also chatty and rambling, covering many topics in each long circuitous post. The purpose was mainly to let friends and family know what we were doing. I now feel we have enough experience under our belts that we can share knowledge on a wide range of topics and my goal is to post more often and focus on a single topic each time. In the future I plan to cover topics such as canning meat, seed saving, vermiculture, doing laundry off-grid, rain water catchment, an explanation of solar power in everyday terms, raising meat rabbits, etc. My goal is to have a new post every 1 to 2 weeks. When talking about 21st century homesteading Mother Earth News says "It's about using less energy, eating wholesome local food, involving your family in the life of the community and making wiser choices that will improve the quality of life for your family, your community and the environment around you. " While the term 'off-the-grid' has been defined as living without reliance on one or more public utilities. Under this definition there are varying degrees of being off-grid based on how many public services you choose to forgo. hopefully it can sustain itself until they all ripen. Last count was 14 tomatoes on this one plant. So, homesteaders may have no ambitions to sever their connections to the public utilities and off-gridders may have no inclinations towards organic gardening and raising their own free-range chickens. Each of these groups have a degree of self-reliance, but no desire to push the envelope to see how self-reliant they can become. 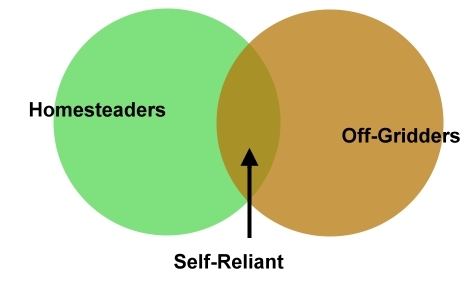 They do not have the goal to become self-reliant, they have the goal to be homesteaders or off-gridders. Four years ago we jumped into the Off-Gridder Circle (above) and started working our way towards the Self-Reliant Intersection as that was our goal. If you knew us before we started our adventure you would agree that we were much more likely to jump into the Off-Grid pool than the Homesteader pool based on the definitions I provided above. Back to how reading an article on failure prompted my contemplation of our own venture to date. First off, no, I do not think we are failing. We are thriving and still enjoying the adventure. I did however find it insightful to reflect on the three reasons brought forth in the article and how they pertained to our endeavors. Oops, I did say these blogs were going to be shorter, well actually I said I wasn't going to ramble as much, so on to the three reasons the article stated as to what causes new homesteaders to fail, all of which can apply to anyone striving for a more self-reliant lifestyle. were doing a much better job. There are so many aspects to self-reliance and so many paths you can travel down, you must choose your priorities from the myriad of projects you feel pulling at you from all directions. In our case, we made severing the grid ties a number one priority. In fact, we severed all those ties in one fell swoop by moving to a property that broke all of our ties to public utilities and services. That in turn meant our priorities remained focused on establishing our own alternatives through solar power, rainwater catchment, etc. At the same time we did 'tinker' with other areas of self reliance we wanted to explore, such as gardening, but we were careful not to spread ourselves too thin in too many directions at once. This is the fourth year for our gardens, which we have expanded each year, and it is the first year that I feel they are really becoming abundant producers. I still consider them to be in the experimental stage of learning what vegetables are the best producers, especially for the least effort and square footage of garden space - more about that in another post. branches on most of the tomato plants this year. I used to feel a little guilty that we did not have livestock, yet (unless you count my worm farm- more about that in another post.). But after reading Reason #1, I felt vindicated that we did not rush out and get a lot of animals we were not prepared for. We had several reasons for making livestock a lower priority, one of which was the fact that we were still travelling back up north on a regular basis to visit grandchildren (oh, and children). By the way, we are in the process of setting up our rabbitry and the breeder rabbits will be arriving soon - more about that in another post. Often people plan for years for when they will have the property of their dreams and the lifestyle they have imagined that will go with it. They scrimp and save and as soon as they have just enough they invest all they have and take the plunge only to realize they are flat broke with lots of things that still need to be bought to make their dream anywhere close to becoming reality. Wow, that sounds depressing, but what I am trying to say is make sure you leave some wiggle room in the budget for the unexpected. the size of a Peanut M&M but very sweet. In other words, be realistic in your goals and expectations, be flexible and roll with the punches and do not take on more than you can handle at one time. At first glance this reason seems to coincides with the backup plans. But to me, the backup plans are for ideas that for one reason or another are not going to work in the real world or have not worked after trial and error. The need to to be prepared comes with the realization that even as you become self-reliant in various areas of your life,the time may come when something unexpected happens. For example, you may feel your garden is adequate because it meets your families needs each year, but what if there is a summer of droughts or floods and you can't put away any produce for the winter? What if you lose your crop and can't gather seeds for next year, and have none set aside? You need to think about areas where your self-reliance can be vulnerable and make preparations to cover more than 'just getting by'. Self-reliance is more than being able to handle the expected day-to-day needs, it is also being able to rely on your provisions during unexpected tough times. In our case, we enjoy challenging ourselves in becoming more self-reliant. There is a lot of gratification in realizing you are responsible for providing the electricity that powers your house, the water that flows in your pipes and the food on your pantry shelves. It is also humbling to realize how much time and work providing these daily needs requires and how much we used to take it for granted.